Rhea Vedro is a metalsmith, cultural producer and educator who enjoys an active studio practice in both steel sculpture and jewelry. She is fascinated by the trajectory of humankind’s relationship with metal -- sourcing it from the earth and learning to refine it into objects of beauty, war, value, infrastructure, ceremony and industry. 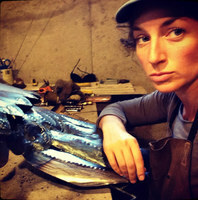 Rhea holds a MFA in Metals from the State University of New York at New Paltz. In addition to her community arts education work, she taught in the Art Departments at SUNY - New Paltz and at the UW - Madison. Rhea has held numerous Artist in Residence positions and served as Program Director for multiple community arts inititatives. She received scholarships to craft schools Haystack, Penland and Peters Valley where she studied blacksmithing and steel engraving. Her sculpture exhibition record includes: a recent solo exhibition at the Arnheim Gallery in Boston MA, Metals Museum in Memphis TN, Samuel Dorsky Museum of Art in New Paltz, NY, The Clara Hatton Gallery in Fort Collins, CO, Gallery Marzen and The James Watrous Gallery in Madison, WI. Rhea lives in Boston, MA and works as the Director of Community Engagement at the Isabella Stewart Gardner Museum.